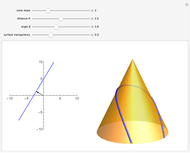 Geodesics on a cone are easily found using the fact that the surface is isometric to the plane. The left image shows a line specified by two parameters, (distance from the origin) and (angle between the normal vector and the horizontal axis). The right part shows a cone together with the geodesic that represents an isometric image of the given line. 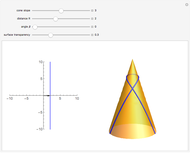 Assuming that the plane is parametrized using polar coordinates as and the cone as , the isometry between the two surfaces is given by , . In rectangular coordinates, the line in the plane is parametrized as , . These coordinates have to be transformed to polar coordinates before applying the isometry.